"Cleaning out my friends list in the next few days... Do you wanna stay?" NOTA BENE: I DID NOT ASK (NOR ANSWER) THIS FACEBOOK QUESTION! But I was shocked to find that it currently has an astounding 27,051 Followers and 730,233 Votes (jumping by the thousands every minute). UPDATE, 12Apr2011, 1:15pm: 79,162 Followers, 2,129,991 Votes. Wow. Just... wow. UPDATE, 15Apr2011, 9:00am: 158,401 Followers, 4,086,811 Votes. It's like watching a car crash. I just can't look away. About 20 years ago, I began listening to the music of Hildegard von Bingen, the legendary twelfth-century mystic, prophet, and composer of ravishing liturgical chants. I was a fan. Big fan. Couldn't get enough of those soaring melismas. I followed the work of Sequentia, whose stated goal was to record all of Hildegard's music by the 900th anniversary of her birth, in 1998. The members of Sequentia were hot sh*t. Musicologists, world-class performers. I went to see them once, in Pasadena. It was like listening to silver-throated angels. I also started to buy every Hildegard CD they recorded. Towards the end of the cycle, Christmas arrived more often: "Woo-hoo! Sequentia's gonna release a new one next month!" 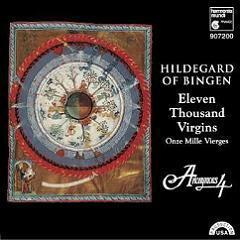 I also started collecting other Hildegard recordings. The "Sybil of the Rhine," as she's known, is a rock star in her native Germany. I have to admit I spent *way* too much money on mail-ordered German CD's. My secret bond with Hildegard was migraines. She had migraines. I had migraines. Still do. But she did a heckuva lot more with her migraines than I ever did. The evidence seems to indicate that she did her best creative work during her migraines. She reportedly had visions from God. She painted the images she saw, and wrote down the ideas. She supposedly had auditory hallucinations, too. She just copied down the music she *heard* during those migraines. Nice. Hildegard ended up running her own abbey. Not bad for a girl who spent most of her teenage years locked up in the wall of a church. In the middle of my Hildegard trance, my workplace made an announcement: they had too many word processors. They offered to pay some of us to leave. It was a nice severance package, so I took the money and ran. Shocked the h*ll out of 'em. I had designed their productivity software, in between processing words, and they hated to see me go. But I had big plans. I was gonna live on their money while I turned myself into a Writer. With a Capital W. So I wrote plays, sitcom specs, short stories, poetry, humorous articles... and screenplays. In the midst of all that creative ferment, I had a series of bittersweet romances - with a French masseuse, an Irish theater professor, a salsa violinist from Chicago, and a SoCal new-Age mystic. So I decided to write a screenplay about all of them. I even threw in some Hildegard mythology. Submitted the first draft to a contest. It did well, much to my surprise. Made it all the way to the semifinals. Then a few other screenplays did just as well, or even better. Well, hoo-ah! That was enough to hook me on the Writing life. I burned through all the severance money. After that, I burned through a six-figure retirement account. Several years later, I finally went bankrupt. Turns out I wasn't as good a Writer as I thought I was. But I must digress for a moment, to explain the title of the Hildegard screenplay. Eleven Thousand Virgins refers to the legend of St. Ursula, who was supposedly martyred in 383 A.D., along with 11,000 of her closest BFF's. It turns out that somebody between then and now misinterpreted the abbreviation "XI.M.V." as eleven thousand (in Roman numerals) virgins rather than eleven martyred virgins. Since Ursula was one of Hildegard's heroes, a few of those migraines were devoted to the 11,000. And I couldn't think of a better title for a script. While I was working on ETV, I was also learning HTML programming. 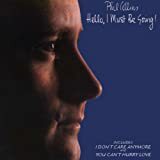 I put together a Discography webpage, just for fun. I was surprised to find all of my Hildegard music, plus a few other recordings, on the web. I think there were 20 or 30 CD's when I uploaded the first version of that page, back in 1996. I updated it a few times over the years, but I haven't touched it since 2007. Late last year, a woman who lives on the Mediterranean seacoast near Barcelona contacted me. She wanted to option ETV. Evidently, the movie circus came to her town one day, and she ended up working on a film production for a couple of months. She looked at what the producers were doing, and it didn't seem that hard, so she wanted to try it herself. With my script. Heh. Since nobody else was expressing any interest in ETV, I figured WTF. So I gave an option to the Lady Of Spain. At the very least, it would provide some entertainment. Plus, she's a charmer, so she may yet shock the heck out of me by actually finding some investors. I'm not holding my breath, but you never know. It's like being handed a free lottery ticket. I started blogging on 4/4/1996 - 15 years ago. I first went online in late February 1996, then spent more than a month converting my screenplay formatting software from the DOS version of WordPerfect to Windows. So March was hairy. But in April, after I put up a website to sell the software, I thought it might be fun to start an online diary. I designed a cute little "Top|Up|Down|End" link-navigation system and started writing. Blogs didn't exist back then. Nobody was really keeping an online diary, because you had to know HTML. And code geeks generally avoid writing. They like to code. 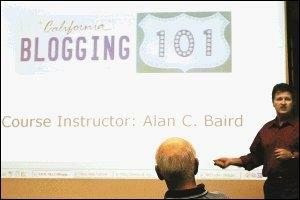 In December of 1997, 20 months later, the term "weblog" was coined. It was subsequently shortened to "blog." In July of 1999, the first automated blogging software finally appeared. By September of 2001, I figured everyone and his dog had jumped onto the blogging bandwagon, so it was no longer cool to be a blogger. Plus, I was burned out. I had to quit. But in February of 2004, I signed up for Blogger and never looked back. PS: I taught a Blogging 101 course for the University of California in 2005, and Palm Springs Life magazine hired me as their online-editor-slash-in-house-blogger soon after. That lasted for only a year, but it was fun. PPS: My screenplay formatting software eventually evolved into this family of 10 free downloads that won a $3,333 prize. This is an April Fools' joke, as envisioned by Anikó's boss: he gave a paycheck to each employee that was $150 short. Like many folks, we are going through tough times financially, and Anikó thought we wouldn't be able to meet our bills... so she burst into tears.